Family lawyer focus on issues that may affect a family structure. Usually, they handle matters such as divorce, the division of marital property, spousal support, child custody and child support. Family lawyers may also help partners to create marriage and domestic contracts that outline the rights and responsibilities of each person in the relationship and what should happen if the relationship ends. Family law matters are extremely sensitive, and often people require the services of a family lawyer at very emotional points in their lives. For that reason, you want to know that you have the right family lawyer on your side. When looking for a lawyer to handle issues relating to your family, you should find one who has experience practising family law for a number of years. You may find that in certain firms, lawyer focus on more than one area. In that case, you must make sure that family law matters make up a significant portion of the lawyer’s caseload. When you select a family lawyer who has consistently, successfully handled matters like yours, you can rest assured that your lawyer knows exactly what to do to ensure a favourable outcome in your case. Whenever you are considering hiring a family lawyer, do a quick internet search for his or her name to see what people have to say. See if you can find online reviews and comments about the lawyer’s services or cases in which he or she has been involved. You may also check the Law Society and Bar Association websites to see the lawyer’s current licence status, whether the lawyer in question has been the subject of any complaints, charges of misconduct, or if he or she has been accused of malpractice. A family lawyer can appear great on paper, have a proven track record of success, and still not be the right lawyer for you. No matter what you have discovered in your research, you must be comfortable with your family lawyer, especially since you want him or her to deal with some of your most private concerns. So, when you meet with the family lawyer for a consultation, evaluate how you feel about continuing the process with that person. If you do not feel comfortable in his or her presence, continue searching. Before you commit to working with a family lawyer, you should be presented with a legal contract. This contract should outline the services the lawyer agrees to provide as well as the legal fees for those services. This contract should also include specific details such as how much you will be required to pay as a retainer deposit and how you will be billed. Never sign a legal agreement unless you are completely clear on the terms. So, if you have concerns about any part of the contract, speak with the lawyer about it. Do you need an experienced family lawyer in Toronto? 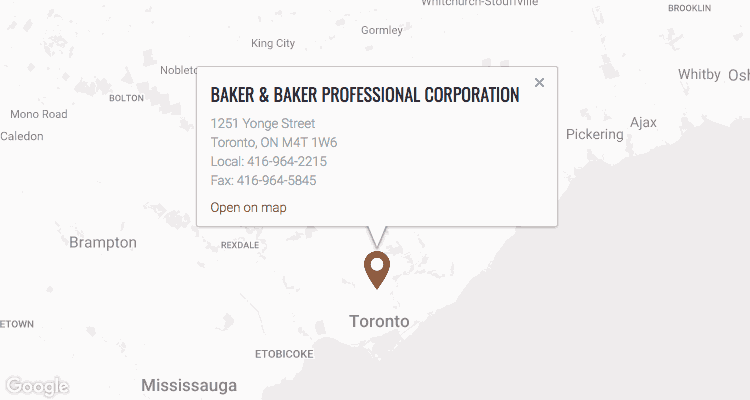 If you are in search of an experienced family lawyer in Toronto, contact us at Baker & Baker Family Lawyers. We know it is difficult and emotional having to deal with problems in your family life. Our team will make what can be an overwhelming situation a little easier to bear by helping you to understand your legal rights and obligations. We will guide you through the family court system and provide you with the support you need. So, give us a call today to schedule a legal consultation. Let us show you how we can help.